It's the halfway point of January, so time to reflect on the progress made. Not too bad really I've had a few of evenings when I've been able to sit down, put on a classic radio series, 1930s Flash Gordon this week, and paint to my hearts content, or at least until the rest of the household return. I also had one night working away, which means I can pack my painting gear into the car and sit in the hotel painting. 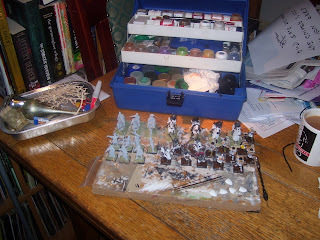 Unfortunately works away also meant I had to pass nearby, 50 mile round trip, to Essex Miniatures. As I was in the area it would have been rude to not call in and spend some Christmas money there. This means I now have another 7 foot and 3 mounted figures to paint, but 5 of my original figures are now ready for varnish and 8 more aren't far behind. Ruarigh and I have only managed a few of games since Christmas, due to work and family commitments. We played Laserburn, were I got my backside handed to me after a good start; Wings of War: Dawn of War were I shot down both of his aircraft; two games of Urban War were we share the spoils; and Koening Kreig were we finished part way through a game with me in a strong position, but Ruarigh fighting back. So just 15 days to go and hopefully I'm well on course to finish the original figures and hopefully the additional figures.